The term tznius in Hebrew means modesty. Most often it is associated with the appropriate way to dress. Most orthodox Jews follow some form of tznius, though customs vary between levels of orthodoxy and the community where one lives. Some orthodox women are so strict that they will only wear long sleeves, long skirts, and neutral colors. Others are more relaxed and are willing to wear any color, short sleeves, and in some cases pants. This article is written to be neutral to all levels of observance. Sleeves should be all the way to the wrists. The fabric of the top must not be see-through. The shirt should be loose-fitting and not cling to the skin ("bodycon" style). The hem of the shirt should be at least several inches below the top of the skirt so that when you lift your arms or bend over, no skin is exposed. The neckline should cover at least the lowest part of the neck. If the shirt has buttons (full button-down or polo style), all buttons should be buttoned, including the top button. If this is uncomfortable, either purchase a larger size for a larger neck or wear another garment underneath, and the top button can be open. It is recommended that you use a pin of some type to cover the top button. This serves as a reminder not to unconsciously undo the top button. If you do not like wearing flashy jewelry, the pin can be of a flat-looking neutral metal. Consider how low of a neckline you feel comfortable with. Some women will not wear anything below the neck. Others feel comfortable with scoop or V-necks. Most likely, you will be wearing skirts. But not all skirts may be tznius for you, depending on your custom. 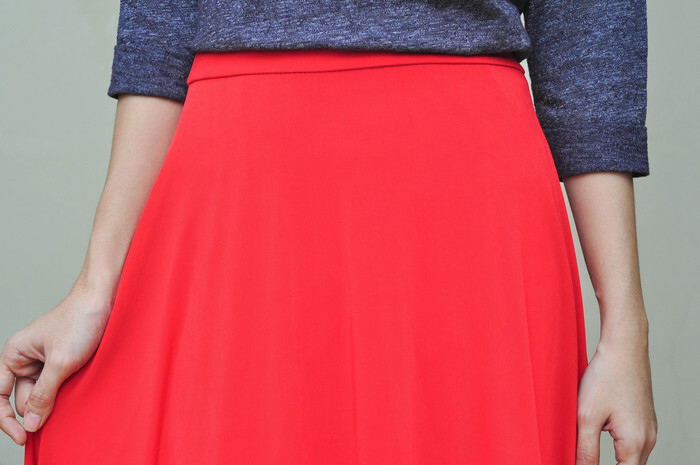 Try on all skirts on the store to be sure they are long enough to meet your standards. Due to height variations, a skirt that comes down to the ankles on one person may only go down to the knees on another. If you are married, you may be covering your hair. 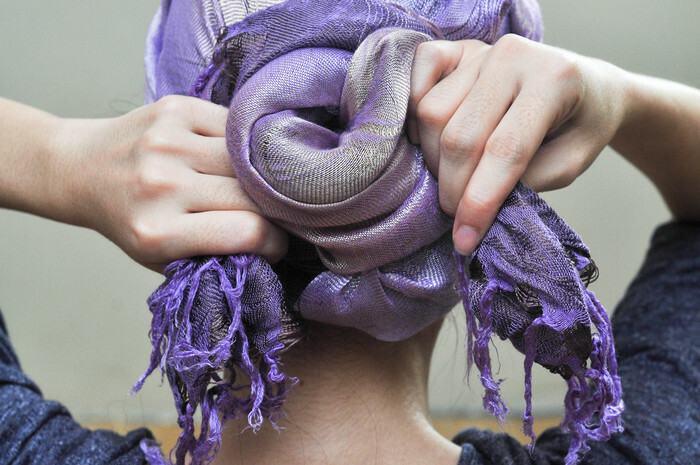 There are a variety of hair coverings on the market available, including wigs (sheitl), snoods, headscarves, and hats. Stores in your community probably sell these for this purpose. While many religious women consider it acceptable to wear short sleeves, slacks, or other styles unacceptable to others, it may still be inappropriate to wear these in certain highly religious environments run by those with stricter standards, such as synagogues, Jewish day schools, or some Jewish businesses. If you don't dress by these standards most of the time, but make occasional drop-ins, it may be worth carrying an extra long-sleeved top and skirt in your car that can be slipped on quickly over what you are wearing before you enter such a facility. It is not uncommon for women to follow tznius requirements within the community and to be more relaxed about these standards elsewhere. If so, be sure you are a safe distance from the community before going into "relaxed mode". You never know who you might bump into. Dressing tznius doesn't mean having to be a religious fanatic. A lot of normal clothes marketed to the general population can be tznius. You do not have to give the appearance of wearing an "orthodox uniform". If you must wear long sleeves and cover your neck, consider the wide range of options available, including long-sleeved T-shirts, sweatshirts, turtlenecks, mock turtlenecks, long-sleeved polos, and button-downs. Some of these made of cotton or other cool materials can be tolerable to wear even on a hot summer day. Likewise, a wide range of skirts are available on the market that can be pretty and/or comfortable, including career skirts, denim, prints, and so on. Garments that are not tznius by themselves are not unkosher. Most such garments can still be worn in conjunction with another garment that covers the parts the un-tznius garment doesn't. If it is a top, a shell may do the trick. If it is a long-sleeved V-neck, you may be able to fill in the 'V' with a sleeveless top underneath. Skirts with buttons down the front can look great on one who is dressed tznius. But there is a possibility that if the skirt stretches enough, one can see through the spaces between the buttons. If so, consider having a tailor sew the seams together. Beware of see-through fabrics. While the fabric of the garment itself may cover the required areas, it may be possible to see through it, especially in high levels of light. Many long sleeve tops have see-through sleeves, for example. If this is the case, a shell or another undergarment solves the problem. Beware of slits on the back, sides, and front of skirt. If that matters to you, take notice of what they expose of your legs when you are standing, walking, and when you are seated.